Figs | Bonsai Society of Australia Inc.
Ficus (or figs) is a genus of close to 1000 different species which include trees, shrubs, vines and epiphytes all belonging to the mulberry family (Moraceae). Some begin life as hemi epiphytes – seeds that are dispersed by birds and animals in crevices in tree tops. Some scientists seem to think that Ficus are an ancient genus being around of between 60 and 80 million years old, but they are coming closer to the age of between 20 and 40 million years. The common fig (F. carica) has been grown in for its fruit in the Middle East and Eastern Europe since ancient times. Some of the other figs have an importance and are eaten as bush food. A lot of wildlife, including fruit bats, monkeys and some birds, relies on the fruits for survival. The citrus long-horned beetle has larvae that feed on wood, including, of course, fig trees and in large fig plantations it can become a pest. Figs have a very unique and distinctive way of pollination with the help of tiny wasps (Agaoninae spp.) only about 2mm long that enter through an opening at the bottom of the fruit. Once inside, they pollinate the long-styled female flowers as they lay their eggs in the ovaries of the short-styled flowers. Without these special wasps carrying pollen from one syconium (seed) to another, there would be no seeds. When the eggs hatch, two wasps emerge; a female and a male. When the male hatches, it finds a short-style flower and bites a small hole in the ovary wall. He then inseminates the female through the hole and repeats the process with every female he finds. The female will then crawl out of the hole made by the male. As a last act in its short life the male will chew through the syconium wall to the outside. The females are then able to leave and repeat this process of pollination and laying eggs in other figs. Some figs have two different kinds of trees in the same species; one tree only bears the syconia fruits with short-styled flowers so the wasps can lay their eggs in and this are called a caprifig. The other tree sets seeds and are delicious so animals and birds will eat them and in turn spread their seeds. The caprifigs are hard and unappetizing and the wasps can develop safely without the fear of being eaten. Each fig has its own unique species of ‘in-house’ wasp pollinator. Pollinating fig wasps are no threat at all to human life. The fruit of the fig is actually not a fruit but the flower of the tree until the wasp has pollinated it to become a fruit. In ancient China this tree was actually called ‘fruit without flower’. The sap or latex in figs is white and milky and can irritate the skin on some individuals and is a serious irritant to eyes. The wood on figs is often very soft and in ancient times it was used to make mummy caskets in Ancient Egypt and bark cloth in Uganda. The Rubber Plant (F. elastica) was identified as a powerful air-cleaning plant by the NASA Clean Air Study. There is evidence that figs were among the first – if not the very first – plant species that were bred for agriculture in the Middle East more than 11,000 years ago. Some sub fossil figs were discovered and dated at about 9400 – 9200 BC and were found in an early Neolithic village in the Jordan Valley. Fig trees also have had religious traditions associated with them. The popular one is the sacred fig tree (F. religiosa) or Bo tree under which Buddha was supposed to have become ‘enlightened’ while sitting under it. Figs are revered in religions like Buddhism, Hinduism and Jainism. Each religion seemed to have a different fig that they honoured. In the bible Adam and Eve covered their nakedness with the leaves of the edible fig. It was even stated that Jesus cursed the fig tree for bearing no fruit. Curiosities in the horticultural world are the strangler figs and these begin when a seed has been deposited in the crown of a tall tree in the droppings of birds and animals. Eventually these seeds germinate and over many years roots start to descend down the frame of the host tree to get its roots into the soil so it can survive. It struggles to receive the sun so leaves start to grow so it can photosynthesize to grow healthily. Eventually over time the roots snake down to completely cover and strangle the host tree and kill it. After the host tree dies and rots away over many years, the fig’s roots become a free standing tree on its own with a hollow centre. This hollow centre then becomes the home and breeding areas for many birds and animals. Some of the other stranglers like the weeping fig (F. benjamina) use aerial roots from their branches and as they thicken form new “trunks”. In this way these stranglers grow outward to form a “fig forest” – a single tree with many interconnected trunks. A particular tree that produces these aerial roots from branches is the F. benghalensis in India (also known as the Indian banyan) and it is listed in the Guinness Book of World Records (1985) as the world’s largest tree, with over 1000 prop roots and covering an area of over four acres! In Spain strangler figs are called Matapalo – ‘killer tree’. Some of the more common strangler figs are – F. aurea (Florida strangler fig), F. macrophylla, F. oblique, F. virens and there are many others. Spreading buttress roots and thick trunks. Leaves miniaturise well with defoliation only after heavy fertilization in early spring and when the tree is very healthy then defoliation can take place around Christmas (December) time. Strike well from seed, cuttings and collected as epiphytes on other trees especially large Washington date palms. Large Root cuttings of some figs especially Ficus nerifolia (the willow-leaf fig) strikes very well. Strike back well on old wood. Also by large cuttings. Not very fussy on soil or fertilizing. 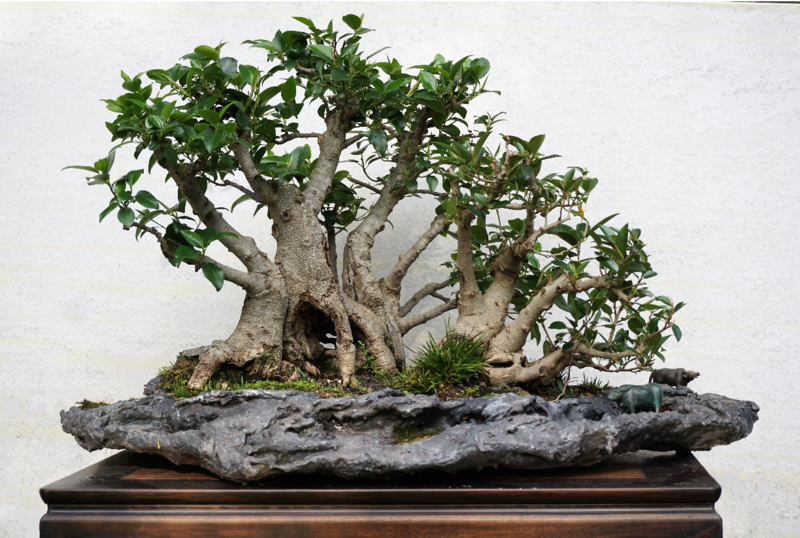 Can be grown in any size bonsai from mame (small) to very large specimens. Cutting across the bole at the widest point and placing in very sharp moist river sand or the like. Making a cone with an aluminium can or similar and placing the young tree roots over the cone and covering with potting mix. Then as it ages, lift the root ball out of the soil to expose the roots. Making vertical cuts around trunk and covering with damp sphagnum moss. Fig roots like to be exposed to the air and sun. Every time you repot lift the tree another 1-2 cm. At the workshops at Leong’s with Min Hsuan Lo he told us that at every repotting of figs take notice of the roots – if they are thin grab a few roots and either plait them or twist them together with a little wire and pin the end of the wire into the potting medium. Then cover the ends of the roots only with some plastic held down by stones or simply by placing broken tiles over them. This creates humidity to encourage the roots to ‘weld’ together to form thick buttress type roots around the trunk. When this happens raise the root flare to show the new buttressing roots that will be exposed. Cut back so to not allow branches to extend too far and when 4 or so leaves develop; cut 2 off to an outward growing leaf bud. Also nipping out new leaf node at the end. This is where a new branch is required on the trunk (usually on the outside of a curve). A hole is drilled straight through the exact middle of the trunk in the position where a branch is required. Then a long thin whippy branch is then threaded through the hole, sealed at both ends and left until new growth is detected and the whip has totally filled the hole in which it has passed. Only then can the back end of the branch be removed and allowing the new branch to continue growing. This is best done in mid spring. CUT A WEDGE CUT OUT OF UNDERNEATH OF A BRANCH TO HELP TO LOWER IT. ALLOW THE TREE TO DRY OUT A BIT FIRST. To lower a large branch a wedge cut is made under the branch at the point where the branch should bend. At the apex of this cut a hole is drilled through the branch which will give the branch more flexibility to bend to the position required. Slowly bend the branch to match up the cambium layers of the existing branch, seal the whole wound and tape up with budding tape once the sealant has dried. This is best done in mid spring. This system works very well on all sap-producing trees. STYLES – Informal, Minis, Semi and Full Cascades, Root over rock, Trees on rock and rafts.